While maintaining optimal oral health is important, there are very few people who haven’t at some point or another experienced some sort of dental injury or decay. Whether you’re currently dealing with a small crack, a cavity, or a full-blown dental emergency, there’s no reason to feel embarrassed – here at D’Amico and Mauck, DDS, our dedicated team will be happy to provide care that can treat your teeth and save your smile. In fact, you’ll find a whole host of restorative dentistry services here at our Aurora office! Fillings – the tried-and-true solution for repairing cavities, Drs. D’Amico and Mauck use composite tooth-colored material to create the most natural results whenever possible. 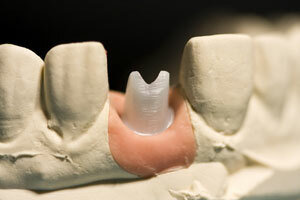 Porcelain Crowns – these beautiful restorations can serve as solution to extensive decay, broken teeth, and gaps. Inlays and Onlays – back teeth that have suffered decay or damage can be better protected with these restorations; we even offer crowns, inlays, and onlays in an hour with the help of our E4D unit! Root Canal Therapy – this procedure can rescue teeth facing extraction by cleansing out diseased bacteria and stopping the infection. If your smile is currently suffering from pain or damage, don’t hesitate to contact our Aurora, CO office as soon as possible! Many oral health problems can become much worse over time if left untreated for too long. Thankfully, our team is committed to providing comprehensive, personalized dental services to patients of all ages – completely judgment-free! We serve the greater Denver area, including Centennial, Englewood, Parker, Denver Tech Center, and beyond!